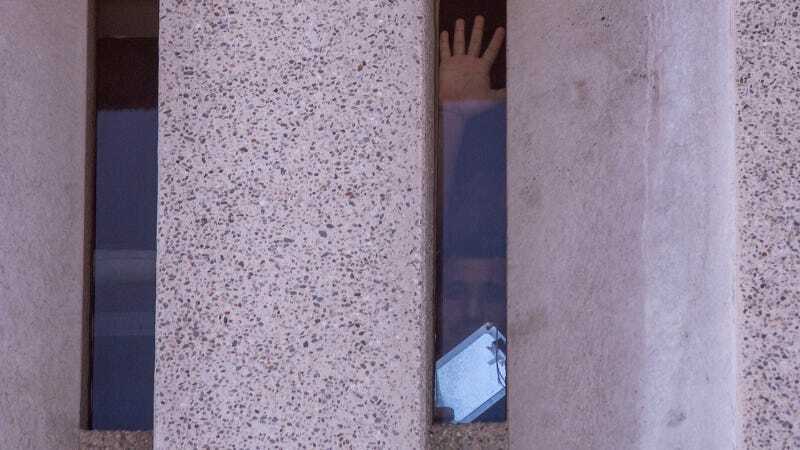 A man being held inside the Metropolitan Detention Center, which houses detained immigrants, responds to calls of encouragement from demonstrators on the street below on June 30, 2018 in Los Angeles, California. As the Trump administration is slowly reuniting (some) migrant children with their families, kids and their parents are speaking up about horrific abuses they endured while in detention. For hundreds of children in the custody of Immigration and Customs Enforcement, forcible separation from their parents was just the beginning of abuse at border patrol stations and detention facilities. The Huffington Post reports that the Center for Human Rights and Constitutional Law has filed a federal lawsuit based on about 200 testimonies from migrant children and their parents who allege that they were beaten, denied medical and basic hygienic care, were not informed of their legal rights, verbally abused, and not given enough food or water while in detention. Some of the accounts come from mothers and children who were detained together, and many are from families who were detained separately. Over the course of four days in June, Keylin says, U.S. Border Patrol guards would kick her body to keep her awake throughout the night. The 16-year-old, whose last name was redacted from court documents, told a lawyer that she would lie in fear on the cement floor of the Border Patrol station in Texas, surrounded by chain-link fence. She was separated from her mother, who had been held at gunpoint three times in Honduras, after they crossed the U.S. border. One mother said her family had to drink toilet water to stay hydrated. Another mother said that her 8-year-old child was forced to wear soiled underwear for days because she was denied a shower. The lawsuit asks a federal judge to appoint an independent monitor to oversee detention facilities and enforce the basic facility standards established in a 1997 agreement known as the Flores Settlement. The Flores settlement requires detention facilities holding children to supply basic living requirements, like food, drinking water, and medical assistance.